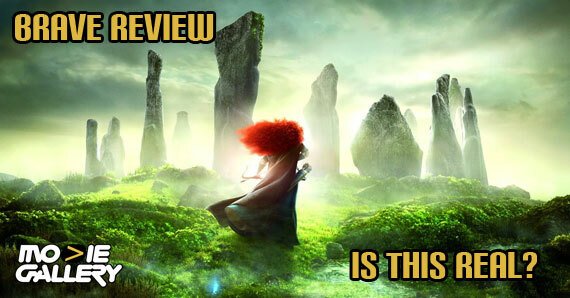 [NEW] Pixar’s Brave Movie Review! Does It Live Up To The Hype? Beautiful. You are going to hear that word a lot in regards to Pixar’s latest effort, Brave. The visuals are, without a doubt, amazing. But even the critically panned Cars 2 looked nice. What we want to know is if the story lived up to the amazing standards the film studio has set for itself. Set in the Scottish Highlands, this is a fairy tale in every sense of the word. There is a princess, a witch, magic spells, and lessons learned all around. Without giving anything away that the trailers haven’t already, Merida (Kelly Macdonald) is a princess intent on being her own person, despite what her mother, the queen (Emma Thompson), has in mind. When the subject of marriage comes up Merida rebels, setting in motion some unfortunate consequences. Perhaps as a result of this being Pixar’s first attempt at a fairy tale, this is easily the most formulaic movie they have ever made. If you have ever watched a Disney movie or read a story of the Brothers Grimm variety, nothing will happen that you didn’t see coming. The beginning is interesting and seems to be setting the story up for an incredibly grand adventure and the end is appropriately heart warming and even exciting, but the middle is just a little flat. Nothing really special happens. It lacks the Pixar magic that managed to bring tears of laughter as well as sorrow to audience’s eyes with scenes involving nothing but a mostly silent robot and a cockroach (WALL-E). Despite the journey not feeling very special, it looks incredible. The photo-realistic mountain and forest scenery are completely gorgeous and once again set a new standard for computer-animated films. You could have told me this was a live action hybrid, filmed in New Zealand, and for many scenes I would have believed you. I have never seen water rendered so realistically, and the trees and countryside are like something out of Avatar; They are so beautiful and realistic. It’s to the point that the people look almost out of place, like the cartoon characters in old Disney live action films. 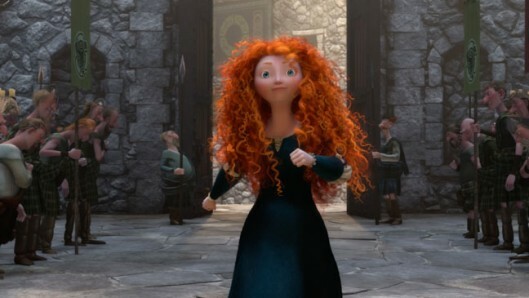 Despite looking animated, the people still acted realistically in a way rarely seen in animation and Merida’s wild red hair is almost unthinkably complex. The screening I saw was in 3D. There is very little “in your face” 3D – rather it is used to bring out incredible detail and create vast landscapes that seem to reach forever, making already beautiful animation all the more so. I don’t want you to get the idea that the only thing this film has going for it are the visuals. The characters are likeable and genuinely funny at times. The story, while feeling overly familiar, is not un-enjoyable. The cast is full of well-known Scottish and English talent who do a wonderful job as well. Bottom line is that kids will love this movie, and if Katniss wasn’t enough, Merida’s exploits will solidify a desire to wield a bow and arrow in the hearts of many a young girl. My recommendation – See it in theaters to get the most out of the incredible visuals, but unless you have kids, there is no reason to rush out and buy the blu ray when it’s released. This entry was posted in Animation, Reviews, The MG Blog and tagged Animation, brave, brave movie review, Entertainment, Film, movie, pixar, Review by HamiltonW. Bookmark the permalink.